eFile.com Reviews: Right Tax-Filing Software for You? eFile.com Review: Is It the Right Tax-Filing Software for You? eFile.com is one of the dozens of online tax software sites that lets you file your taxes online via software that guides you through questions which will determine whether you owe the IRS or the IRS owes you. 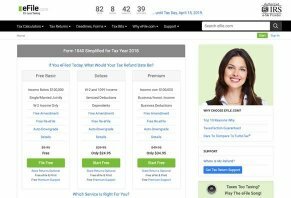 The eFile website is simple and deceptively extensive, as you can choose a tax software option, learn about tax deadlines, understand the history of taxes and get a comparison between eFile’s prices and TurboTax’s prices. The eFile website is run by a company named TaxWork LLC that is based in Venice, FL. We did some quick searching for the company but couldn’t find anything about them. While not finding any information is a bit unusual, having a tax company run a website under a different name is relatively common. In this review, we’ll give you an analysis of how the site works, which options work best for which types of filers as well as talk about the fees you’ll pay and how those fees compare to other tax-filing sites. At the end of our review, we’ll gather up all the data we’ve observed and give you our fact-based conclusions about eFile.com’s strengths and weaknesses. eFile is like many other tax software websites in that you go to their site, look over their various filing packages and choose the one you think best fits your particular tax situation. eFile has three pricing tiers from which you can choose: free basic, deluxe and premium. Based on our research, we’ve found that eFile’s free option is accepting of high levels of income – up to $100,000, to be exact. Most free filing sites have a cap on how much income you can claim in order to get a free filing. The site’s free filing covers all the usual tax situations – single, married filing jointly, W-2 income – and also includes the earned income credit (EIC). If you have to refile a tax return in which there was a mistake, you can do that with the free version, too. The site’s deluxe tier is $24.95 and its premium tier is $34.95. All state returns are $23.95, bringing your total to anywhere between $23.95 to $58.90 depending on which tier you choose. In the next few sections, we’ll help you see which tier is best based on common filing situations. The deluxe option in eFile is pretty robust in that it covers a wide variety of tax situations. For example, if you have kids, this is the tier you’ll use because you may be able to get tax credits because of your children. This feature also covers situations in which you’re a caretaker at your home for a relative. Keep in mind, though, that you’ll have to answer a few questions regarding this part of your tax return in order to verify that you can claim a child or someone you’re taking care of as a dependent. This option provides you with the ability to itemize your deductions, too, which allows you to calculate student loan interest, mortgage interest, property tax and other common situations through which you could reduce your tax liability via deductions. Of note is that this tier also includes any income you earned from investment and retirement income. Forms related to these two sources of income would be a 1099-R and a 1099-DIV, as well as an 8960. These forms cover interest and payouts related to your retirement and/or investment accounts. This final filing tier includes all the situations we mentioned earlier plus several key distinctions. First, if you’re a freelancer and you’re filing the typical collection of 1099’s and claiming deductions like having a home office, this is the right tier for you. The site will guide you through questions whose answers will automatically populate a Schedule C, which is the deduction form that calculates your various expenses. This tier is also the right fit for those who are a partner in a business and earn shareholder income via a Schedule K1 form. If you’ve earned money as a beneficiary and/or through a trust, you’ll need to use the premium tier, too. Now that you’re aware of which tiers fit which taxpayers, it’s important to get a sense of the perks that come with all three filing tiers. The main ones we want to point out are eFile’s accuracy and max refund guarantee. According to their website, the IRS tests their site each year to make sure it’s ready to roll for tax season. Therefore, there shouldn’t be any mistakes when you file. Our takeaway from these two guarantees is that there is no clear statement that eFile will refund your filing fee if they make a mistake when submitted your return or if your refund is less than it should be as a result of their site’s errors. TurboTax, on the other hand, will provide you with a refund of your fees if they find your refund was smaller than it should be as a result of their error. The other main benefit you get with this site is the ability to send questions to their support team as you’re filling out your taxes. The site, however, did not provide any information about how quickly their support team will get back to you. We did some research into what past customers of eFile.com had to say about their experience on their site. The existing reviews we found at the time of publishing were, for the most part, negative. Common complaints focused on poor customer service, forced upgrades that happen at the end of their tax return and situations in which the site filed their tax return late. Multiple customers noted that they either switched to another tax software the year they filed with eFile.com or they vowed not to use the site. One of the things that you’ll want to do every year your file taxes is to check sites for their pricing, as said pricing can change from year to year as companies add and change features available in their various filing tiers. As you can see from this table, eFile.com’s prices are the best when it comes to self-employed taxes. However, you’ll need to remember that TaxSlayer doesn’t charge you extra for a state return, which makes it cheaper than the $58.90 you’d pay to do self-employed federal and state taxes with eFile.com. As far as which site will work best for you based on price, that has a lot to do with how much you’re willing to spend and what you want in terms of the ratio of price to value. TurboTax, for example, is more than twice as expensive as eFile.com but the site’s tax software and customer service is perhaps the most well-known and the most popular among taxpayers. Their site, as well as H&R Block and TaxSlayer, offer upgrades through which you can correspond with tax pros about your return. While eFile says they offer free support “taxperts,” they don’t say what types of qualifications these “taxperts” have or if they’re actually tax experts or just customer service agents familiar with the software. On the other hand, TurboTax notes that their tax experts are CPA’s and enrolled agents (IRS experts) who have an average of 15 years of experience. Both H&R Block and TaxSlayer provide tax professionals to help you with your return, too. All of these sites will charge you extra to access tax professionals during and after your return. In general, we believe that eFile.com’s value is average to below average, if only because their state tax filing fees push it beyond the cost of what you could be from TaxSlayer. Now, if you happen to live in a state that doesn’t charge income tax, then eFile’s premium tier is a far better value. At the time of publishing, those states were Alaska, Florida, Nevada, South Dakota, Texas, Washington, and Wyoming. We believe that you, as a taxpayer, should be concerned about two main things when you file taxes with online tax software: price and features. A good site is going to give you an optimal mix of a user-friendly experience along with prices you can manage. Along with this comes the luxury of being able to pay extra so that you can access tax professionals while you’re filling out your application. With these things in mind and based on the facts we gleaned from our research of eFile.com, we believe the site’s greatest strength is that its free and deluxe versions are a great fit for many taxpayers who have simple returns or own a home and have kids. The site’s weaknesses are that we found multiple customer reviews that indicate the user experience isn’t quite as good as it should be. We also believe that other well-known tax sites offer better value and the peace-of-mind that comes with brand recognition. If you want to learn more about these bigger sites, take a few minutes to read through our rankings of the best tax software website of 2019. In the article, we give you an in-depth analysis of how TurboTax, H&R Block, TaxSlayer and TaxAct compare to each other. Write a Review for eFile.com!